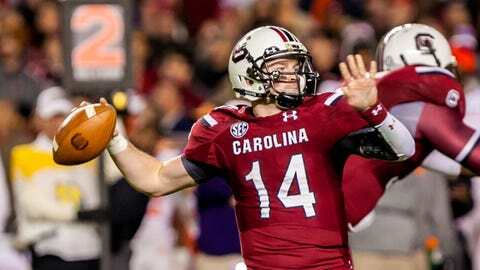 In 259 passes over the season, South Carolina quarterback Connor Shaw has thrown 21 touchdowns and just one interception. Here we are, on the cusp of another New Year’s Day bowl game for Wisconsin’s football team. Maybe it doesn’t come with the same level of prestige as the Rose Bowl, but a victory in the Capital One Bowl against a tough South Carolina team would put quite a cap on the first year under head coach Gary Andersen. What can the Badgers expect? South Carolina isn’t exactly Alabama or Auburn, but the Gamecocks are awfully close. It will take Wisconsin’s best performance of the year to come away with a win. South Carolina has won its last five games, including a win at then-No. 5 Missouri, and is playing its best football of the season. Wisconsin, meanwhile, is coming off its worst game of the year in a 31-24 home loss against Penn State. Personnel: Offensively, you have to start with Gamecocks quarterback Connor Shaw, who has put together a marvelous season. Consider that he has thrown just one interception in 259 throws, and he also has 21 touchdown passes. Shaw doesn’t air it out the way other teams do. He throws about 22 times a game. Wisconsin quarterback Joel Stave, on the other hand, throws about 27 times a game. Still, Stave has 12 interceptions. South Carolina will need Shaw to be sharp, but the Gamecocks do possess a 1,000-yard rusher in Mike Davis (1,134 yards, 11 touchdowns). Shaw is the second-leading rusher with 511 yards, and nobody else is over 256 yards. Shaw has done a nice job of spreading around his throws, and receiver Bruce Ellington has the most catches with 43 for 635 yards and six touchdowns. Shaq Roland has five touchdown catches, and Damiere Byrd has four. On defense, most of the talk has centered around defensive end Jadaveon Clowney, although his numbers have disappointed this year. Clowney burst onto the scene last season with his jarring hit on Michigan running back Vincent Smith during the Outback Bowl. It helped cap a stellar year for Clowney, who finished with 54 tackles, including 23.5 tackles for loss and 13.0 sacks. He tallied 4.5 sacks in one game against Clemson last year. This year, Clowney has been a marked man, and many would say he hasn’t lived up to the preseason hype. Clowney has a total of 35 tackles with 10.5 tackles for loss and only 3.0 sacks. Of course, facing double teams is a key reason for his diminished stat line. Defensive tackle Kelcy Quarles has stepped up 13.5 tackles for loss and 9.5 sacks. Quarles ranks tied for ninth in the country in sacks per game. More on Shaw: How good is Connor Shaw’s ability to avoid interceptions this season? In the FBS, 204 quarterbacks have thrown at least two interceptions this year. Keep in mind there are only 125 FBS teams. Of the quarterbacks to have thrown one interception, Kentucky’s Maxwell Smith (183 passes, nine touchdowns) is the only other quarterback with at least 100 throws. Points aplenty? South Carolina is averaging 34.1 points per game, which ranks No. 31 nationally. Wisconsin is averaging 35.8, which ranks No. 25. But that hardly means the Capital One Bowl will turn into a shootout. The Gamecocks allow 20.0 points per game on defense, which is tied for 13th nationally. The Badgers are allowing 14.8 points and rank No. 5. Four teams have eclipsed the 30-points mark against Wisconsin this season, and the Badgers are 1-3 in those games. South Carolina has allowed 30 points just once — in a 41-30 loss at Georgia. In the fast lane: Clowney recently picked up his second speeding citation in less than a month when he was clocked driving 84 miles per hour in a 55-mph zone. He received a $445 ticket. In early December, Clowney was given a $355 ticket for going 110 miles per hour in a 70-mph zone. Clowney, a junior, is expected to declare for the NFL Draft after the bowl game. "He needs to go to driving school, doesn’t he?" South Carolina coach Steve Spurrier told reporters during a press conference in Orlando, Fla. "At least he’ll have enough money to pay for it in a week or so."